Edinburgh Rugby’s Greig Tonks admits he now feels a fully fledged member of the Scotland squad after spending the last two months in camp – and he cannot wait to show his worth when the World Cup warm-up games start next week. The 26-year-old, who is equally at home at stand-off or full-back, has won four Scotland caps to date, being on the fringes of the national team over the past few years. After making his debut against Samoa on the summer tour of 2013 he had to wait until this year’s Six Nations to make three more appearances off the bench against Italy, England and Ireland. And now, having been in the extended squad since June, he is ready to force his way into head coach Vern Cotter’s 31-man party for the World Cup which will be selected at the end of this month. Ahead of next Saturday’s first warm-up match against Ireland in Dublin, Tonks said: “Training has been going really well and although there have been a lot of tough sessions for me I think the fact that we have been together so long as a group has helped. “It has given me a chance to gel with the boys who I perhaps didn’t know that well when I was coming in and out of the squad while it has allowed me to really get a grip on how the team are looking to play. “We obviously have all come into camp from various different clubs who play different ways, but Vern and the other coaches have been adamant from the start of this camp saying ‘this is the way we want to play’. When he joined Edinburgh back in 2012 Tonks was seen mainly as a full-back, but in the second half of last term he was used most regularly at stand-off and he even played centre for Scotland at one point. 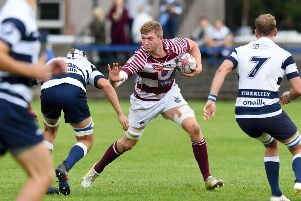 Versatility can be a bonus when you are heading into a tournament that spans a few weeks – and the former Northampton Saint is just keen to impress no matter what number is on his back. After the Ireland match, Scotland play Italy (twice) and then France and he explained: “I have mainly been running at stand-off in training and also a bit at full-back, but we will have to see what the coaches are thinking when the games come around. Being versatile can be good, but it can also be not so good because you never quite nail down one spot. Over the last couple of months Tonks has been impressed by how newcomers like Edinburgh team mates WP Nel, Allan Dell and Damien Hoyland have fitted into the Scotland set-up. “The guys have loved being here and have really added something – hopefully they will earn their first full caps in the coming weeks,” he stated. Tonks was speaking at BT Murrayfield where he, along with international team mate Fraser Brown, was handing over jerseys to players who will be representing Scottish team ‘The Clan’ in the first mixed ability rugby world tournament later this month. The event takes place in Bradford with 12 teams taking part from August 18-21 and mixed ability rugby enables players with a learning disability to play alongside those who do not. There are a number of Capital-based players in the mixed ability squad including Gregor Devine, Josh Rogers, Andrew Scotland, Grant Anderson, Callum Calderwood and Ryan Collins.